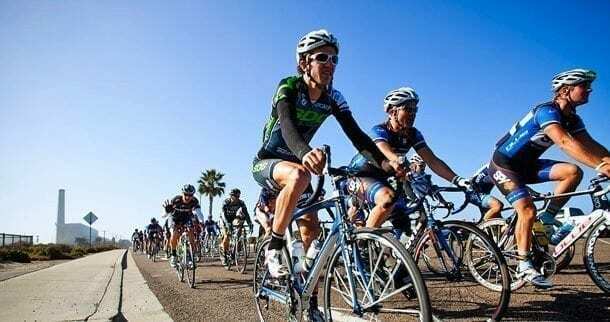 On Sunday, April 15, San Diego-based eyewear brand SPY held its inaugural Belgian Waffle Ride. The event brought 160 of the nation’s best cyclists and bike industry luminaries together for a grueling, hilly, 124-mile ride with 9,000 feet of vertical climbing through scenic North County San Diego. Riders began with an authentic Belgian waffle breakfast before embarking at 8:30 a.m. from SPY headquarters in Carlsbad. The route took riders through a 20-mile “neutral” processional—which hit speeds approaching 30 mph—through Carlsbad and Oceanside, followed by 100 miles of high-performance terrain that challenged even the toughest riders as they climbed, sprinted, hopped and clattered over the sinuous roads and off-road trails that carve through San Diego’s backcountry. For most of the participants, the most challenging part of the route was a five-mile climb to the top of Double Peak—the second highest peak in the San Marcos Cerro de las Posas Mountains—at the end of the race, via a climb up the dirt road of Questhaven and then San Elijo. Nationally-ranked cyclists, including SPY cycling team members such as U.S. National Champions Ryan Trebon, John Walsh and Nicole Duke, participated in the ride. SPY donated all entry fees, upwards of $5,000, to the UCSD EyeMobile for Children at the Shiley Eye Center, a mobile eye exam and care resource for underprivileged youth in San Diego County.